I spent the morning mixing concoctions of color! 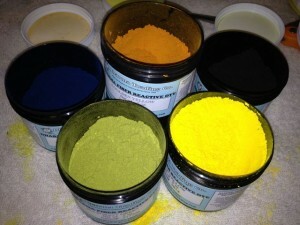 About a month ago I went online and purchased six jars of fiber reactive dye from the Dharma Trading Company. Golden Yellow, Cobalt Blue, Lemon Yellow, Turquoise, Kelly Green and Forest Green. 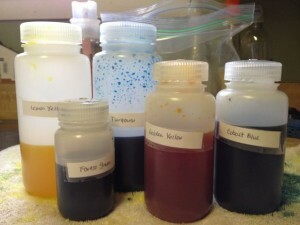 The first four were the blues and yellows needed to follow the recipes in my dye book. Lemon Yellow and Turquoise being “clear” colors or what we might know as primary colors and Golden Yellow and Cobalt Blue being muted or mixed colors. 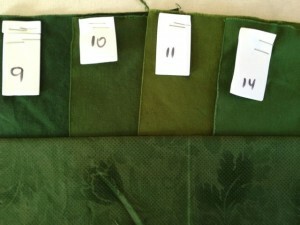 I also bought the Forest Green and Kelly Green because they looked like approximations of the colors I was seeking for my quilts. I really hesitated before clicking on the “Submit Order” button in the Checkout. Did I really want to do this? I wasn’t sure but something in me felt that I needed to try it out for the sake of some kind of thoroughness in the learning process I was undergoing. Did I want it enough to blow $40 on products and shipping? That was probably the harder question, but I clicked anyway and waited for the arrival of my purchase. This morning was my third dyeing session with these synthetic dyes (as opposed to the natural dyeing I’ve so enjoyed.) The first two times were mostly lessons in the process. 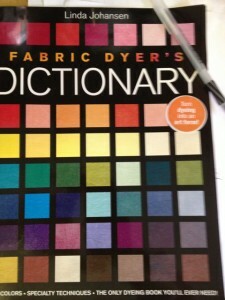 Linda Johansen, the author of “the only book about dyeing you’ll ever need” warns that it takes a few times to learn the process before dyeing becomes comfortable and fun. It’s good I was prepared for that because for the most part the first session of dyeing produced a few pieces of overly dark fabric that I didn’t even bother to wash or dry. That might have been a mistake because the second session produced what looked like more overly dark fabric as well. But this time, I washed it three times and put it in the dryer before heading to bed. I was delighted to find some interesting colors in my dryer the next morning! Unfortunately, however, all the labels had disintegrated in the washer/dryer so I could only guess at which formulations created which colors. Not good. Still, it felt like a small success and baited me to continue. So, on a quiet (grey) Saturday morning, I once again set up my space and started mixing colors. 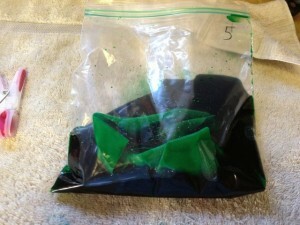 I made five dye mixes and then started the process of following the recipes I’d written out. Place a quart sized labelled ziploc bag in a container. 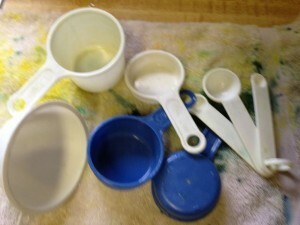 Measure out the amounts of dye required into a measuring cup 1C. Add water fill the 1 cup measure and pour into the Ziploc bag. 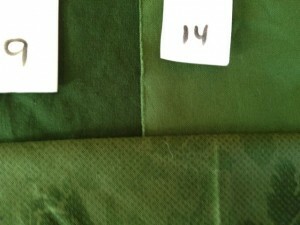 Close bag, removing as much air as possible & agitate to mix fluid and fabric. 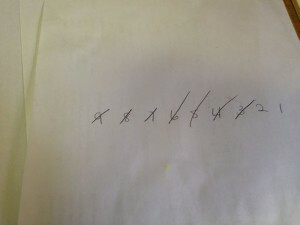 Agitate bags every 10 minutes x 9 or 90 minutes. This is what I am doing as I currently write. I set the timer on the oven for 10 minutes and go do other stuff between the timer’s beeps. I took a garbage bag down to the TV room and cleaned up quite a bit in ten minutes. I’ve emptied the dishwasher. I’ve checked Facebook. And I’ve written most of this. I still have 30 minutes to go. 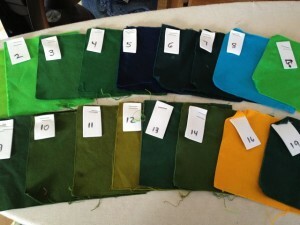 Then the fabric will sit in the pouches until later this evening. Johansen recommends leaving it overnight and I might do that, but it seems like it is better for me to do my laundry runs in the evening.